Winner of the 2007 National Book Critics Circle Award in criticism, the 2008 Guardian First Book Award, a 2010 Premio Napoli prize in foreign literature, the 2011 Grand Prix des Muses, and a Music Pen Club prize in Japan; finalist for the 2008 Pulitzer Prize in general non-fiction; shortlisted for the Samuel Johnson Prize; one of the New York Times's 10 Best Books of 2007; also on best-of-the-year lists in the Washington Post, the LA Times, New York, Time, The Economist, Slate, and Newsweek. A New York Times, LA Times, and Boston Globe bestseller; translated into fifteen languages; inspired a year-long festival at the Southbank Centre in 2013. 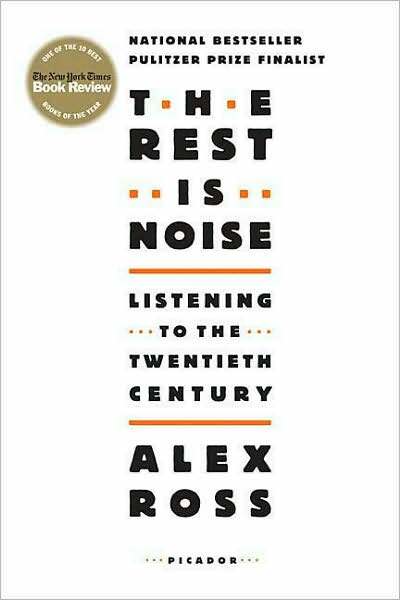 The Rest Is Noise is a voyage into the labyrinth of modern music, which remains for many people an obscure and forbidding world. While paintings of Picasso and Jackson Pollock sell for a hundred million dollars or more, and lines from T. S. Eliot are quoted on the yearbook pages of alienated teenagers across the land, twentieth-century classical music still sends ripples of unease through audiences. At the same time, its influence can be felt everywhere. Atonal chords crop up in jazz. Avant-garde sounds populate the soundtracks of Hollywood thrillers. Minimalism has had a huge effect on rock, pop, and dance music from the Velvet Underground onward. 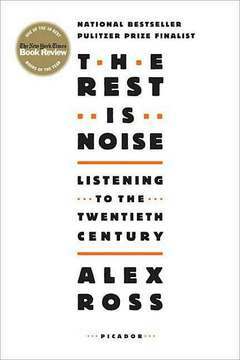 The Rest Is Noise shows why twentieth-century composers felt compelled to create a famously bewildering variety of sounds, from the purest beauty to the purest noise. It tells of a remarkable array of maverick personalities who resisted the cult of the classical past, struggled against the indifference of a wide public, and defied the will of dictators. Whether they have charmed audiences with sweet sounds or confronted them with dissonance, composers have always been exuberantly of the present, defying the stereotype of classical music as a dying art. The narrative goes from Vienna before the First World War to Paris in the twenties, from Hitler's Germany and Stalin's Russia to downtown New York in the sixties and seventies. We follow the rise of mass culture and mass politics, of dramatic new technologies, of hot and cold wars, of experiments, revolutions, riots, and friendships forged and broken. The end result is not so much a history of twentieth-century music as a history of the twentieth century through its music. Click here for fifteen pages of audio samples. Click here for reviews and advance praise. I started working on the book in the year 2000. The title I chose for the project, The Rest Is Noise, played off Hamlet's last words ("The rest is silence") and, more widely, the perception that classical composition devolved into noise as the twentieth century went on. The book was published in October 2007 by Farrar, Straus and Giroux; the UK edition, by 4th Estate, appeared in March 2008; Picador issued a US paperback, with an expanded discography, in October 2008. Translations are available from Companhia das Letras (Brazil), Ambo / Anthos (Netherlands), Piper Verlag (Germany), Seix Barral (Spain), Bompiani (Italy), Actes Sud (France), Casa das Letras (Portugal), PIW (Poland), Argo (Czech Republic), Janis Roze (Latvia), Corpus Books (Russia), Modan (Israel), Algoritam (Croatia), Studentska Zalozba (Slovenia), Misuzu Shobo (Japan), and Book21 (South Korea).